Michael Schumacher's condition has shown a slight improvement, but the seven times Formula 1 world champion remains in an induced coma in a critical condition. 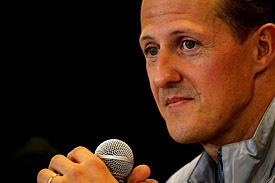 Schumacher underwent a second operation on Monday night to remove another haematoma, which has helped to reduce the inter-cranial pressure he sustained in a skiing accident on Sunday. The second procedure took place at 10pm on Monday after examinations revealed an unexpected improvement in the 44-year-old's condition. This allowed the medical team in the Grenoble hospital to access a large haematoma on the left side of his brain. Dr Emmanual Gay said: "There was one haematoma that was larger and more accessible, so we were able to get rid of it without any risk. "Thanks to that we were better able to control inter-cranial pressure. There's still a lot of haemorrhaging." The medical team said that there remained a number of lesions on Schumacher's brain and that it is still impossible to make any prognosis about his future recovery. They confirmed that Schumacher will remain in a coma for as long as is necessary, but that he is in a more stable condition than had been the case during the previous 24 hours. "We have a strategy to correct a number of anomalies that continue and we want to give ourself some time during this phase of stability," said Professor Jean-Francois Payen. "There are some important matters we need to think about for the future." Schumacher's family were consulted before the second operation and remain by his bedside.